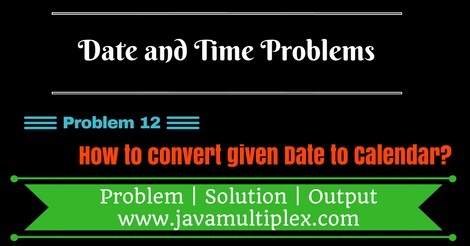 Home Basic Date Questions Conversion Problems How to convert given Date to Calendar in Java? Write a program in Java that converts given Date to Calendar. By default Calendar represent current date, for converting given date to Calendar we have to use setTime(Date date) method of Calendar class that is present in java.util. * package. * @problem How to convert Date to Calendar? Output - How to convert given Date to Calendar in Java? Tags : Date and Time problems, Conversion problems, Date to Calendar in Java, String, Solution in Java, DateFormat, SimpleDateFormat, Regular expressions, if else statement.